“The bearded face of the detained Chinese artist Ai Weiwei is spray-painted on a nondescript gray wall overlooking the steep lanes of Hong Kong’s nightlife capital, Lan Kwai Fong. This graffiti, appearing all over Hong Kong, has become a political statement, more than a month after the world-famous artist was detained by the authorities at Beijing airport. The campaign could yet lead to a jail term for the young graffiti artist responsible. And that fact has led to fears about the erosion of Hong Kong’s distinct freedoms, which are a legacy of its colonial past under the British. 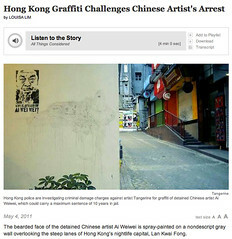 Despite causing consternation for the authorities, many Hong Kong residents like both the graffiti’s aesthetic and its political message. See my other Ai Weiwei entries. Vote on May 2nd – These young people are voting! You should too! Remember to vote on May 2nd. I admire people who try to make a difference in this election. Vote on May 2nd. Click here for more entries and videos about vote mob! Advance voting for the 41st general election begins Friday, April 22, and continues Saturday, April 23 and Monday, April 25. Advance polls are open from noon to 8:00 p.m. (local time) across the country. Electors can find the location of their advance poll on the back of the voter information card mailed to them by Elections Canada. Electors who did not receive a voter information card or who received one with incorrect information may contact theirlocal Elections Canada office or use the automated Voter Information Service, available at any time by calling 1-800-463-6868. All electors must meet the voter identification requirements when they vote on election day on May 2, or at the advance polls on April 22, April 23 or April 25. Electors may choose any of three options to prove their identity and address. Some identification documents used at provincial and municipal elections may not meet federal election requirements.